Today, it's World AIDS Day. It's not really a celebration but a reminder. A day that all UN members states since 1988, which is 29 years. Interestingly, the first theme of the day in 1988 is "Communication" and this year, it's "My Health, My Right". Rightfully, it is your health and of course, you have the right to it. Communicating on AIDS/HIV is a never ending fight, we fight to end it. Back on the film. It is now showing exclusively at GSC. This is a local documentary film; At Rainbow’s End started its screening at Golden Screen Cinemas in 10 locations across nine states. Tickets are available at GSC ticketing counters and via its website. 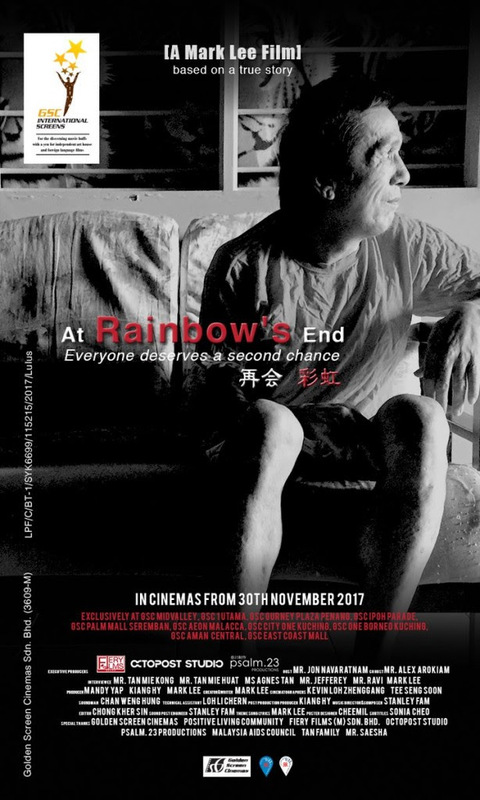 At Rainbow’s End is a true story of Tan Mie Kong, a man living with HIV who lost contact with his family 12 years ago, after he contracted the virus from unsafe drug use. The producers of this film recorded the journey of this man to trace and reunite him with his family, using the only contact details he has – the mobile phone number of a younger brother who refuses to be in touch with him. “Golden Screen Cinemas aims to continuously deliver enriching cinema experiences to customers, and part of this is through our brand of unique, alternative content available under the International Screens portfolio. International Screens offers audiences powerful, emotional stories with universally human themes, and we are honoured to be able to exclusively collaborate with the Positive Living Community and Fiery Films to show At Rainbow’s End, a film which touches on family, redemption, and the endurance of the human spirit,” said Koh Mei Lee, Chief Executive Officer of Golden Screen Cinemas. Main cast, crew and supporters of “At Rainbow’s End”. From left: Mark Lee (Director), Agnes Tan (Cast), Tan Mie Kong (Cast), Mr. Jon Navaratnam (Positive Living Community), Mr. Alex Arokiam (Positive Living Community) and Prof. Dato’ Dr Adeeba Kamarulzaman (Chairman, Malaysian AIDS Foundation and Vice President, Malaysian AIDS Council). “The story of Tan Mie Kong challenges the stigma, stereotypes and prejudices often associated with people living with HIV. He is living proof that being HIV-positive is not a death sentence and with compassion and proper treatment, care and support such as the services provided by Positive Living Community, people living with HIV can lead productive, meaningful, dignified lives,” said Professor Dato’ Dr Adeeba Kamarulzaman, Chairman of the Malaysian AIDS Foundation. At Rainbow’s End is a story of hope, love, and forgiveness; a tearful yet joyous journey of discovery. It is a realistic and truthful story that aims to educate audience and remove the stigma around HIV, while championing the values of what it means to be family. The film is proudly presented by Fiery Films (M) Sdn. 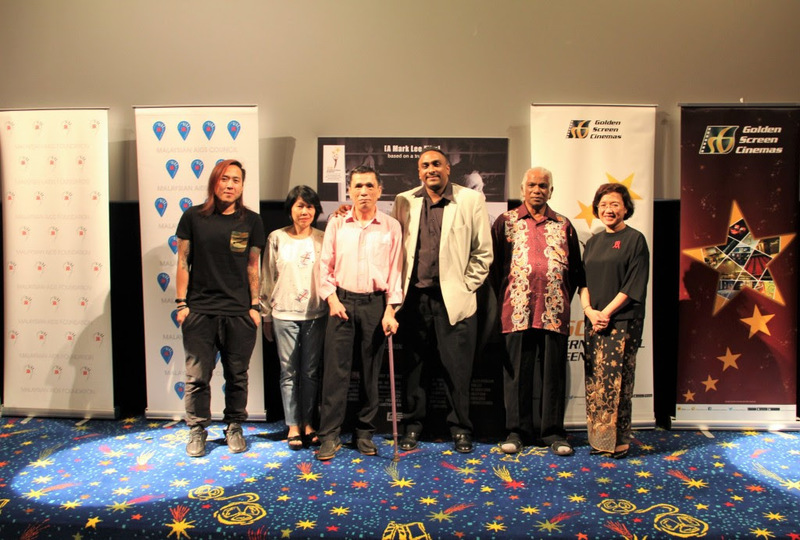 Bhd., in collaboration with Golden Screen Cinemas, the Malaysian AIDS Council (MAC), Malaysian AIDS Foundation (MAF), and Positive Living Community (PLC). FYI, Fiery Films (M) Sdn. Bhd. is a film production company which is established 3 years ago by a group of passionate filmmakers. Mark Lee, the i- house film director whom is also one of the founder of Fiery Films believes that a film maker’s responsibility is to make a difference to the society/ community through the medium of film. Although Fiery Films has been focusing mainly on production works, of which have won numerous industry awards, it has been since 2 years ago they begin on self-funded projects in producing documentaries to glorify unsung heroes of Malaysia. Taking a bolder step, they are involved into producing a feature length documentary ‘At Rainbow’s End’. Knowing that the journey of producing this piece is a challenging one as the journey might lead to anywhere and adding that there are no commercial values in it of which a mainstream exhibitor will most likely decline its distribution, Mark Lee and his very supportive team believes that it is a right thing to do and proceed with the plan. ‘At Rainbow’s End’s’ journey begins with a photograph of Tan Mie Kong done and posted by Ms. Grace Vary on ‘Our Better World’s’ social media. Then Mark was drawn by Tan’s story and quickly contacted the founder of Positive Living Community (PLC), Mr. Alex Arokiam and his assistant Jon Navaratnam. The research began a year ago which proceed into its filming stage of about a month. The process of filming was an unexpected one which leads the team to a surreal ending of the journey. On Positive Living Community (PLC): Positive Living Community, and its previous entities, for the last 20 years, has been providing shelter, care and support to PLHIVs. Throughout the years we have evolved with the times. Where previously we used to be a shelter for the homeless PLHIVs to come and die with dignity, we are now a shelter where the homeless PLHIVs stay and receive treatment and care to live out their days in peace. There is light at the end of the tunnel for them to live a long and fruitful life with the advancement of medical treatment and care. Tan Mie Kong is one of these patients. Referred to us by Sg. Buloh Hospital’s Infectious Disease Ward, Ward 55, he came to us with full blown AIDS, acute TB and permanent partial paralysis. His TB was so bad, caused by defaulting on treatment many times due to the fact he was homeless and therefore unable to self-regulate his medication. The next few months, through his resolve to never again relapse to drugs, he persevered and begun to get better, despite being permanently disabled. As he improved, he began to develop a deep sense of regret for his past actions, mainly to his family and the many trespasses he had done to them. Positive Living Community will continue to fight the stigma of AIDS and care for those PLHIV. As a 100% charity based NGO, which accepts ALL ethnic groups regardless of religion. The Malaysian AIDS Council (MAC) was established in 1992 to serve as an umbrella organisation to support and coordinate the efforts of non-governmental organisations (NGOs) working on HIV and AIDS issues in Malaysia. MAC works in close partnership with government agencies, the private sector and international organisations, to ensure a committed and effective NGO-led response to the HIV epidemic. In addition to providing nationwide coverage of HIV prevention, treatment, care and support services, MAC and its Partner Organisations serve as the common voice for communities most affected by HIV and AIDS in the country. Visit www.mac.org.my to learn more. The Malaysian AIDS Foundation (MAF) was formed in 1993 to raise and administer funds to support the activities and programmes of the Malaysian AIDS Council and its Partner Organisations. MAF funds high-impact HIV prevention, treatment, care and support programmes such as harm reduction, shelter homes, financial and medical assistance schemes as well as HIV health literacy and empowerment activities for underprivileged women and children living with HIV and other key populations nationwide. Learn more at http://yam.org.my/V2/. In support to fight AIDS/HIV, if you can, wear a red ribbon today, or the entire week!